NEWPORT NEWS, Va., Jan. 29, 2010 -- Northrop Grumman Corporation (NYSE:NOC) returned the nation's newest nuclear-powered aircraft carrier, USS George H.W. Bush (CVN 77), to the U.S. Navy following the completion of modernization and maintenance work accomplished during the ship's post shakedown availability and selected restricted availability (PSA/SRA).
" 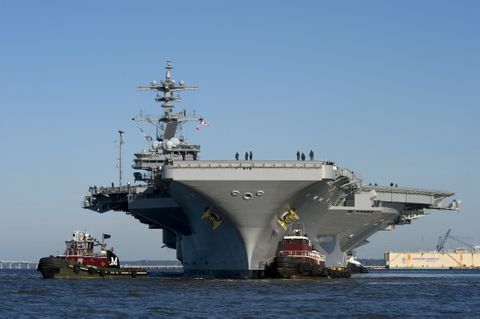 Bush is a testament to the teamwork between the Navy and Newport News," said Mike Shawcross, vice president for Northrop Grumman Shipbuilding's aircraft carrier construction programs. "We worked closely with one another during this availability to return the ship with high quality and within budget. This is a proud and historic moment for our shipbuilders as our 10 th and final Nimitz -class carrier joins the Navy's fleet, where she will serve for the next 50 years." Named after America's 41st president, USS George H. W. Bush is the 10 th and final Nimitz -class aircraft carrier. Its keel was laid Sept. 6, 2003; it was christened Oct. 7, 2006; commissioned Jan. 10, 2009; and delivered May 11, 2009. At 1,092 feet in length, USS George H. W. Bush is nearly as long as the Empire State Building is tall. It weighs 97,000 tons, is powered with two nuclear reactors, and operates for more than 20 years without refueling.